Unlike the vast majority of the plants that we call vegetables, asparagus is an herbaceous perennial that goes dormant in the winter. 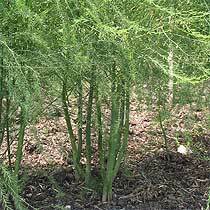 The shoots that are not cut for eating develop into airy, ferny foliage plants growing 3 to 5 feet high. Asparagus need full sun in order to produce a bountiful supply of spears. In Sonoma County we generally start asparagus in late winter, by planting 2 year old bare-root crowns (the roots and base of the plant). An average family of four will need about 30-40 plants. Think carefully about where you want to plant your asparagus because they will be a long-lived part of the garden, producing spears for up to 15 years. Soil preparation is very important. Spade plenty of organic matter (aged manure, compost, etc) into the soil, at least two feet deep. This will help add nutrients, and improve drainage and aeration. You will need about 200 square feet for two rows 20 feet long and 3-4 feet apart. In this area, dig two trenches 8-10 inches deep, 12 inches wide, and 20 feet long. You could certainly make the rows shorter if you want to. Just be sure to keep the rows 3-4 feet apart. Place the crowns at the bottom of the trenches, spreading their roots out as best you can, placing them about 12 inches apart. Cover the crowns with 3-4 inches of soil. As the shoots emerge in the first season, continue to fill the trench with soil until it reaches ground level. Spread organic mulch between the rows and the crowns, 2-4 inches deep to provide nutrients, keep the soil moist and help control weeds. Supplement with a balanced fertilizer in the spring, following the directions on the package. Keep the soil moist, but not soggy. Check the soil 4-6 inches down before you water to determine whether you need to water or not. As with most vegetables, good drainage is important. Do not harvest the spears until the second year to allow the plants to develop strong roots. If you’ve planted one year old crowns, you’ll need to wait an additional year. The first year your harvest should be very light. Only pick a few spears, leaving the rest to develop into foliage. Then the following years you can begin picking more spears. Cut the spears carefully just below the soil surface to avoid injuring the crowns. There’s actually an asparagus knife available just for this purpose! The season generally lasts about 2 months – you should harvest every day or every other day, as you want to harvest the spears when the tips are still very tight and smooth. Once the buds have begun to swell the asparagus will not be nearly as tender. When the new spears begin to thin to less than ½ inch in diameter, stop picking. Allow the spears to grow and develop foliage to restore food to the roots. The plants are not unattractive and make a nice contrast to other vegetables or your ornamental garden. In late winter, prune back the dead foliage down to the ground and spread a 2-4 inch layer of composted material on top. Asparagus are sensitive to competition for nutrients so it is important to keep the weeds at bay, as well. Asparagus is delicious and versatile – it can be steamed and eaten with a splash of balsamic vinegar or lemon juice for an easy and healthy treat, or if you are more adventurous it can stand up to robust dressings such as Hollandaise or Aoli. If you are grilling your main course, put the lightly oiled asparagus spears on the grill and roll to cook both sides. If you pick a particularly generous batch one day, steam them all, eat some right away and chill the rest. Dressed with your favorite vinaigrette they make a lovely salad the next night. Asparagus soup is also easy, delicious and flavorful, and can be frozen to enjoy long after you have harvested the season’s last spear. Asparagus crowns can be ordered from Peaceful Valley Farm and Garden Supply in Grass Valley or locally from many farm and garden centers.